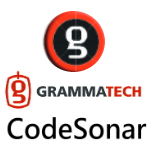 GrammaTech is the developer of CodeSonar, the most powerful source and binary code analysis solution available today. Extraordinarily precise, CodeSonar finds, on average, 2 times more serious defects in software than other static analysis solutions. Designed for organizations with zero tolerance for defects and vulnerabilities in their applications, CodeSonar provides static analysis for applications where reliability and security are paramount - widely used by software developers in avionics, medical, automotive, industrial control, and other mission-critical applications. Some of GrammaTech's customers include Toyota, GE, Hyundai, Kawasaki, LG, Lockheed Martin, NASA, Northrop Grumman, Panasonic, and Samsung.